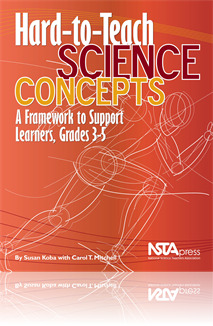 Authors Susan Koba and Carol Mitchell introduce teachers of grades 3–5 to their conceptual framework for successful instruction of hard-to-teach science concepts. Their methodology comprises four steps: (1) engage students about their preconceptions and address their thinking; (2) target lessons to be learned; (3) determine appropriate strategies; and (4) use Standards-based teaching that builds on student understandings. The authors not only explain how to use their framework but also provide a variety of tools and examples of its application on four hard-to-teach foundational concepts: the flow of energy and matter in ecosystems, force and motion, matter and its transformation, and Earth’s shape. Both preservice and inservice elementary school teachers will find this approach appealing, and the authors’ engaging writing style and user-friendly tables help educators adapt the method with ease.